On 20th October 2016 Transpower deployed the National Market for Instantaneous Reserves (NMIR) project, a joint initiative between Transpower and the Electricity Authority. The project was part of the Reserves and Frequency Management Programme and introduced changes required to create a national market for reserves by allowing reserves to be procured in one island to cover generation risk in the other. Shared reserves between islands allows the generation risk being covered by instantaneous reserves to be evaluated as the largest single national risk rather than the combined total of the largest single risk in each island. This allows the quantity of reserves procured to be reduced. Competitiveness in the instantaneous reserves market will be enhanced as the lowest cost national reserves offered into the market can be considered regardless of which island contains the generation risk to be covered. Less reserve required to be procured in a more competitive market will result in lower costs. We have created some animations to help describe the concepts of national sharing of reserves. Will there be changes to IR Cost Allocation? There are no changes to IR Cost Allocation. The Electricity Authority has consulted on this topic. The consultation and decision documents can be found on the Electricity Authority website. The quantity of reserve that can be shared between the islands at any given time varies between 0 MW and 220 MW and is dependent on conditions on the power system and various other constraints. 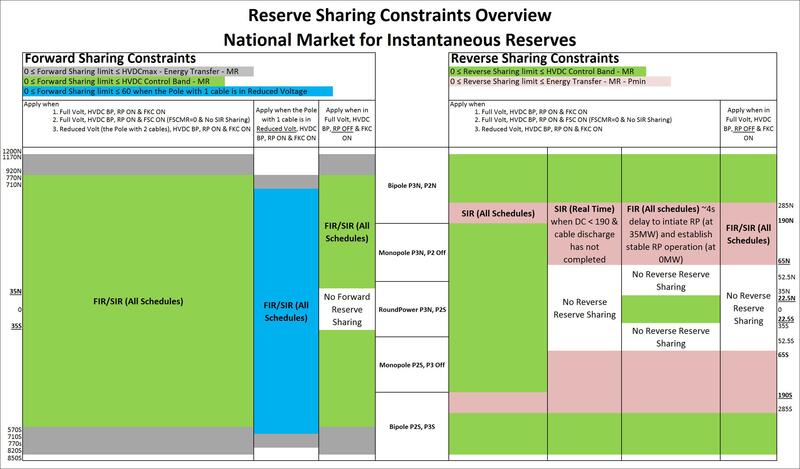 The following is a simplified overview of the reserve sharing limitations under the various system scenarios. For more information on NMIR and how it works refer to the following table of documents, the further down the table you go the more detail is provided. Introduction to NMIR, what enables it and why are we doing it. Brief description of the main design challenges and how they were dealt with. Definitions of terminology that is new or pre-existing but now more relevant than previously. Note: This presentation links to animations hosted on Transpower’s youtube channel, an internet connection will be required. Quick review of background & objectives, introduction to the details of sharing, new operational procedures, deployment approach and other changes coming with NMIR (i.e. secondary risks, DC Overload, MWMax). Description of the deployment approach being taken. Reaching into the detail of different reserve sharing scenarios and how the system will run differently from island based markets. Information on how the reserve will be cleared in each island and how the island IR prices will be set. Short visual of reserve sharing limits for main operating modes and DC transfer levels. Formula enabled workbook covering various key operating modes & scenarios. Document providing the decision on how the IR cost allocation for AOPO-dispensated generation will be completed after NMIR has been implemented. DC Marginal Prices with NMIR [ pdf 465.06 KB ] Description of the impact on marginal IR pricing when there are two binding IR risks in one island. The detailed SPD formulation and RMT Specification documents published as per our service provider obligations. If you have any concerns or questions after the change has been deployed, please contact Market Operations during business hours on (04) 5907470 or market.operations@transpower.co.nz.